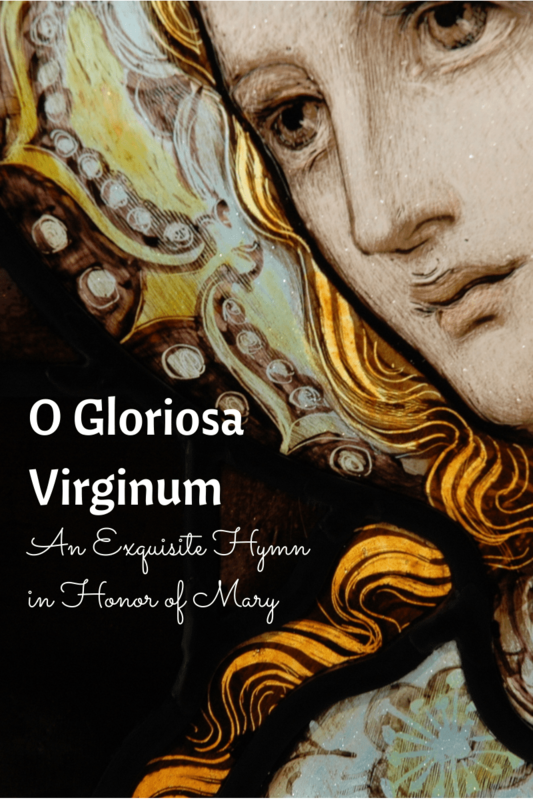 Found in the St. Gregory Hymnal and Catholic Choirbook from 1920, O Gloriosa Virginum is a Marian hymn with a sweet melody that is easy to sing and love. You might consider using it for the feasts of the Assumption or Immaculate Conception at church or home. Children and adults will be able to learn the Latin without too much trouble. I have a feeling this joyful hymn might become a family favorite! Let the children practice the words first, by reading and/or repeating the words after you. I like to say the words with the rhythm of the melody, too. (“O Gloo–ri-oo–sa Viir–gi-nuum.”) When I do this, I “speak” on one pitch or tone; this is called recto tono, or a reciting tone. First graders (or younger) can learn to sing Latin if you take it 1-2 phrases or lines at a time. Just read the words and have them repeat them back to you. Then sing one line together several times until you both feel comfortable enough. Continue practicing for as long as the child is interested, and then sing it to them (or simply out loud as you go about your day) a few times to review. Soon, you will start to hear your children singing as they play or relax! From Him who made thee thou hast won grace to be Mother of His Son. The tear-worn sons of Adam’s race through thee have seen the heavenly place. Thou wast the gate of heaven’s high Lord, the door through which the light hath poured. Christians rejoice, for through a Maid to all mankind is life conveyed. All glory, as is ever meet to Father and to Paraclete. This work (O Gloriosa Virginum, by P.J. Van Damme), identified by Erin McFarland, is free of known copyright restrictions.